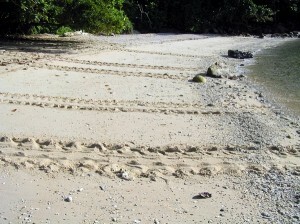 Nesting tracks on Munjor Beach, actually all from one hopeful mother trying to find a nice location! Finally this year as the nesting season is picking up, Munjor beach appears to be living up to its past reputation with three sets of tracks all in one morning, a welcome sight on our morning patrol. These tracks actually came from one turtle, Green Turtle, a mother that was looking for a good spot to nest, eventually leaving just one nest for all this walking around!